Join the discussion on our forums! 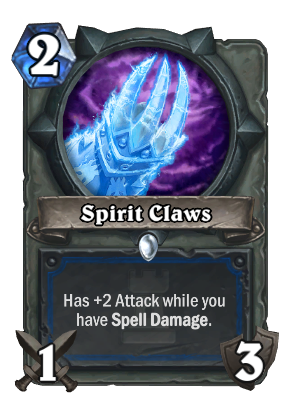 Come discuss Spirit Claws over in our dedicated Spirit Claws discussion topic. They'll be MUCH easier to use once they add the spiritthumb. Light's Justice cried when it saw Spirit Claws. Period. Doesn't Blizzard learn at all? They had to nerf Tuskarr totemic because the totem it summoned was too swingy - either a bit undervalue or hugely overvalue. This is just repeating that once again - 75% you are okay but 25% of the time you win huge - and there is no way for your opponent to plan for it. loving these cool rogue weapons blizzard has released! How to win as shaman...get claw, get spell damage, win. If you lose, you must be really bad. 25% chance to win the board control fight on turn 2. I think making this 2 mana would balance this. another terrible designed card like old tuskarr. if they dont get spell totem, its still a decent card. if they do, you lose so much tempo. Now we just need something which benefits from Searing Totem on turn 2. This card seems to be doing very good in mid-range shaman. Their mid-range archetype is much less clunky and slow by replacing Argent Squire with spirit claws. Also worth noting, is that these work very well with Azure Drake. You'll easily still have a charge left by turn 5. Simply play Azure Drake and now he's a 4/4 Fire Elemental that draws you a card and only costs 1 less mana. Enjoy your turn 5 tempo swing and likely win against other mid-range/tempo decks (which is most of ladder). I don't think this will replace Argent Squire in mid-range shaman because Argent Squire is just too good with Flametongue Totem. In mid-range, it'll likely replace Tunnel Trogg funny enough. Mid-range runs about 4-5 overload cards, so Tunnel Trogg isn't as powerful. I'm wondering if this card will have shaman run Bloodmage Thalnos considering shaman got Maelstrom Portal as well. No, no. Has +2 Attack while you control something with Spell Damage. It's not "GAINS +2 Attack for each minion with Spell Damage you control". can't wait for this beauty to be released! Finally a nerf for Jungle Moonkin! !